This week we are celebrating all the help we get from our wonderful volunteers in our beautiful Walled Garden! 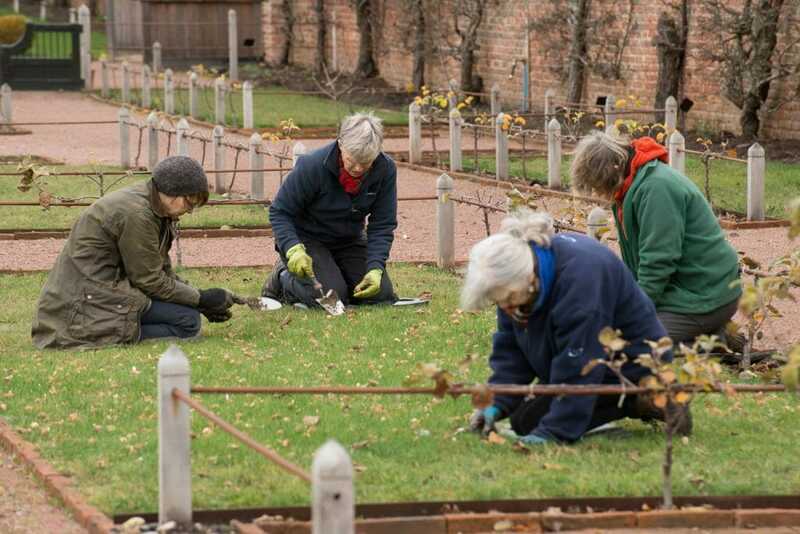 Throughout the years we’ve had many people volunteer time helping develop the garden to its full potential and we are ever so grateful of all who come to lend a hand. We are proud to support the WWOOF program where volunteers can experience a wide range of opportunities all across the world on organic farms. We have welcomed a number or volunteers throughout the years through this program and have seen a real positive effect to the garden because of them. Check out our short video below where we interviewed two volunteers from Brazil last winter. As well as working with the WWOOF program, many of our volunteers come from the local area, keen to help us complete this historic project. One of our regulars, Margaret has been with us for over four years now.We managed to steal a second of Margaret’s precious time to ask about her volunteering experience. We too are a fan of our outdoor performances and with over five lines up including Pride and Prejudice, Dr Dolittle and The Midnight Gang it will be a jammed packed schedule. Find out more details here. We love to get our volunteers involved with as wide a range of jobs in the garden as possible. You can expect to do everything from weeding, seed sowing and planting out to harvesting, cutting, arranging and drying flowers and decorating the café and shop. We’re always happy to teach volunteers about what we are doing so no previous gardening experience is necessary. We take volunteers Monday to Friday from 10am-4pm and are very flexible as to when and how long you would want to work. We also offer a free friends of the Walled Garden membership, a bowl of soup for lunch and free garden produce depending on what is available to all our volunteers. We truly appreciate all the help we get as it is invaluable to the garden and to our business. As a big thank you we are hosting our 4th birthday garden party on the 7th July to celebrate all our volunteers, staff and their families. There will be live music, a bbq and lots of craft cider to enjoy. You are all invited! If you would like to volunteer in the garden, we would love to hear from you! Please send your CV and details to info@gordoncastlescotland.com.